And HOW IN THE WORLD do you think we got Altirra (and other SUPERB work here) up to where they are today? By just back-patting each other and kissing our foreheads? This notion of "because its free you accept it and don't criticize it" is essentially meaningless and harmful. Sorry to be a rude awakening here, but it is much better to face the truth, as it is, and build upon it a better future, for everybody (devs. and users alike). Progress only comes out of truthful and real criticism. Well, reading through the posts again they really don't sound as critical as I felt them to be when I wrote my first post. So my post might have been inappropriate and I do apologize to anyone who might have been offended by it or felt that his post was criticized. I do not disapprove of critique at all. I do, however believe, that everyone who shares some work with the community is entitled to receive a "thank you", regardless of how small or simple his/her contribution might be. The community is not entitled to an upgrade but I believe that a "this is good already, thanks for sharing with the community. You can make it even better by adding this and changing that" approach will more likely result in more impetus for the average developer to improve upon his work than just saying "we need this". Approval and appreciation for work done is a powerful motivation for future work. Seems odd when something is three years in development and no one in the community, and yes AA is not the only but one of the main, seems to have mentioned it? Edited by Wrathchild, Fri Oct 12, 2018 1:52 PM. I'll try and be the god cop here..
Its a positive that its been updated and its quite a nice looking interface (if not a little confusing), its a first release in the current state and I hope it gets upgraded taking in to account the little hints that Avery has added, there's definite potential and it does a reasonable job at what its built for BUT and there has to be bad cop too, it needs to be more accurate, an emulator is only as good as its accuracy, no matter if you are emulating the flight characteristics of a rocket or an computer / console, if the end result is flawed then it needs work.. I'll look forward to more versions but Altirra will stay as my first choice and probably only choice bar a bit of fun...You have to go where the goings good! Haha... I really love god cop.... excellent! Just want to clarify that this was very much not my intention, I just wanted to report some issues. Ok then I take the accid test and put my fingers in the wounds. You are right my statement could be misinterpreted. Sorry if I did. But in the end of the day its an emulator in the core and failing the accid Tests is a no go... sorry. If anyone was beta'ing it then its probably worth saying now its out, I admire the dedication and loyalty but its a tried and tested formula that you let it loose in the wild to the public and let them dive in, any issues and needed stuff will be found so quickly its worth the time to the developer.. This must be the reason for the difference in styles (posting styles, i.e., perceived attitudes, etc.) Been around a long time, but was never a paying customer of Xformer, so missed all the drama from back then. Edited by Heaven/TQA, Fri Oct 12, 2018 3:50 PM. Look at it this way, my wife is able to use Xformer from download to play without my help. Credit for the main idea to Xformer crew, as it is due! Edited by Faicuai, Fri Oct 12, 2018 3:58 PM. Definitely recognize the love of this platform and hard work put in by the programmers. I have run it successfully on Windows 7, 8.1 and 10 (64 bit version). Thanks for this release and looking forward to future releases. 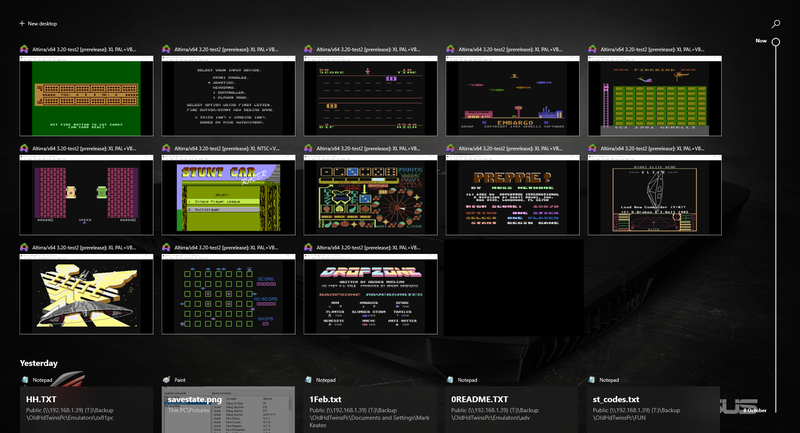 I don't think we can ever have too many emulators! Great effort towards the fun factor here. You BetchaBottomDollar.. can never have enough emulators! I wish they would compile this to run under Win XP. Altirra does. Why don't they? That is my main complaint at this point. I haven't been able to even try this thing. Before anyone asks why I run XP on my Probook i5 Quad, it's because I LIKE it, and I REFUSE to be SPIED upon by M$. They will spy on you whatever. They might even see you as more of a need to spy on wierdo for not having Win10. I think it's generally accepted that the deprecated operating systems are low-priority when it comes to telemetry data, etc. And it's a little easier to manually weed out and disable the 'phone home' stuff in XP, by all accounts. I) think it's generally accepted that the deprecated operating systems are low-priority when it comes to telemetry data, etc. And it's a little easier to manually weed out and disable the 'phone home' stuff in XP, by all accounts. Altirra is designed with emulation quality in mind, sometimes over speed and polish. ... sometimes over speed and polish. Harsh... have you enabled warp speed? Disable Altirra's re-use instance option and they can be run in parallel. Are people surprised code based on that running on '386-like processors can run multiple instances on today's processors and available RAM? As a Win7-Pro die-hard, as well as current WinXP-Pro and Win10-Pro user, I would strongly suggest (at this particular point in time) you to consider moving UP to Win10-Pro. There are important, under-the-hood changes in Win10-Pro, not just at the User Interface level, or even vastly improved RDP (which is key for my line of work). I currently run Win10 on a HP-Z840 with Broadwell-EP E5-2696v4... stability and reliability are keys in my work. Win10 is clearly a better, more robust OS with a significantly improved user-experience, all round. Edited by Faicuai, Sat Oct 13, 2018 9:26 AM.